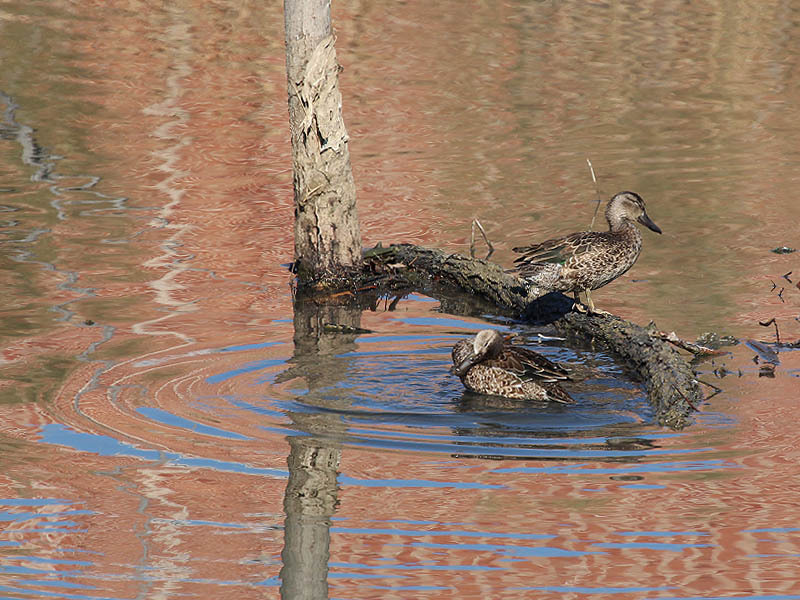 We have here a couple of female Blue-winged Teal hanging out in a suburban Beaver pond located in a residential subdivision. The Blue-winged Teal is 40 cm (16 in) long, with a wingspan of 58 cm (23 in), and a weight of 370 g (13 oz). The adult male has a greyish blue head with a white facial crescent, a light brown body with a white patch near the rear and a black tail. The adult female is mottled brown, and has a whitish area at base of bill. Both sexes have sky-blue wing coverts, a green speculum, and yellow legs. They have two molts per year and a third molt in their first year. The call of the male is a short whistle; the female’s call is a soft quack. 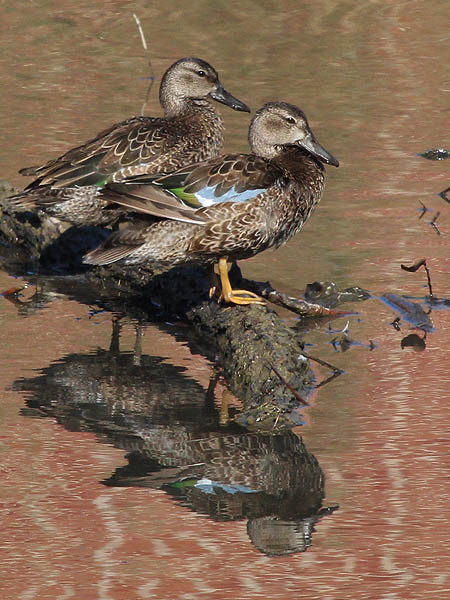 Blue-winged Teal are generally the first ducks south in the fall and the last ones north in the spring. Adult drakes depart the breeding grounds well before adult hens and immatures. Most Blue-winged Teal flocks seen after mid-September are composed largely of adult hens and immatures. The northern regions experience a steady decline in Blue-winged Teal populations from early September until early November. 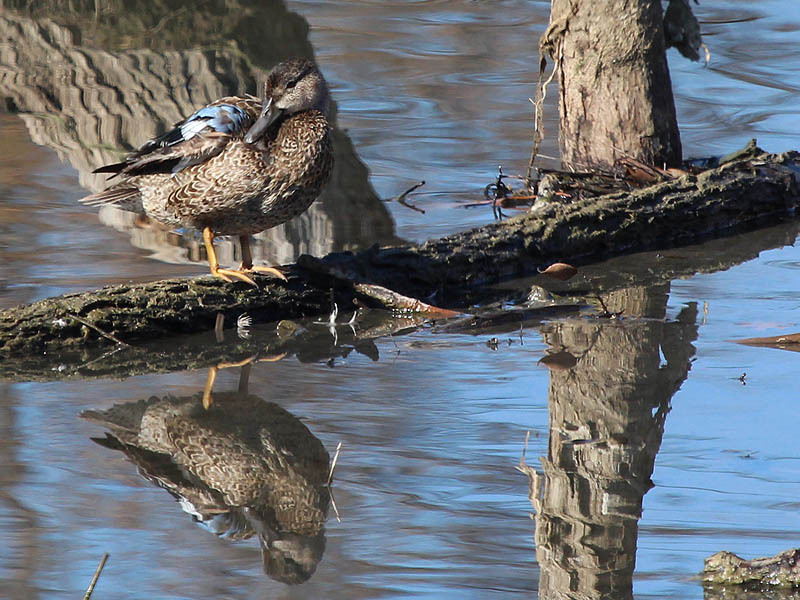 Blue-winged Teal in central migration areas tend to remain through September, then diminish rapidly during October, with small numbers remaining until December. 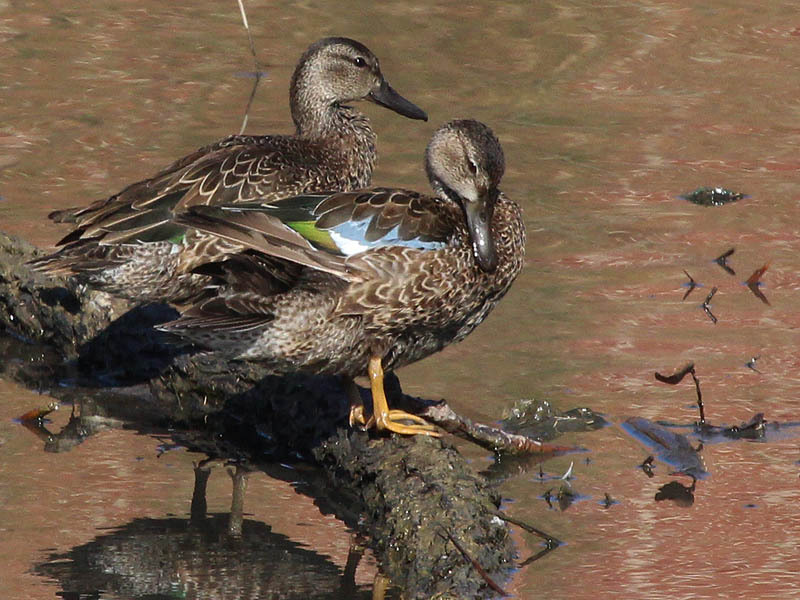 Large numbers of Blue-winged Teal appear on wintering grounds in Florida, Louisiana, and Texas in September. Nice series of photos Chris. This is one of my favorite ducks. 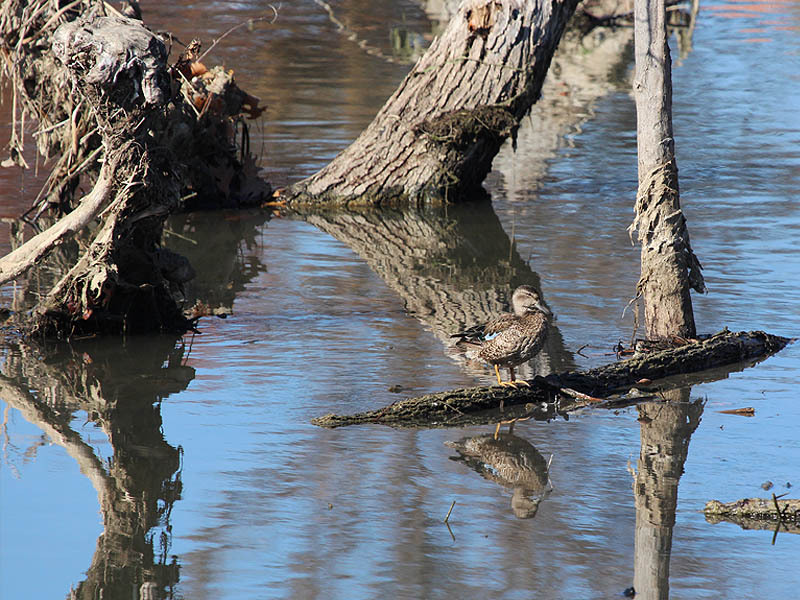 Despite the information in the Wikipedia article, Blue-winged Teal actually occur in most of Texas year-round, though they are most abundant during fall and spring migration, and winter numbers are greater than breeding season. Some of the spring and summer birds do breed, including in wide-spread areas of the state, though most nests have been found in the Panhandle. Nesting numbers fluctuate greatly from year to year depending on water levels and wetland conditions. Nesting may have occurred in N. Central Texas, though. In the nineties there was a nest on the campus of Texas Women’s University in Denton, though it is not clear whether the birds were escapes from an area aviary or normal wild birds. I was privileged to see the brood after it became mobile. The same year, a pair attempted a nest in the wetland area of Lake Lewisville near Hwy 380, according to a reliable acquaintance. I saw those birds, but not the nest, which I was told flooded out, in June of that year. Thanks for the info, David. Do you remember where on the TWU campus the teal nested? Chris, I saw the brood, ducklings following the parent, at the pond near the campus chapel. 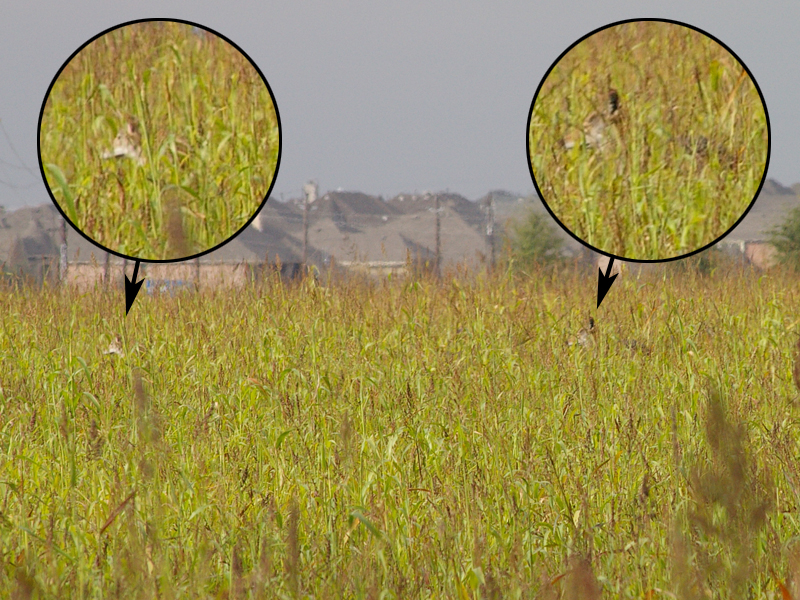 I was told that the nest was in the drainage ditch that flows through that area, but I did not actually see the nest. I lived there at the north end of Austin Street in the early 1990’s and sometimes walked around the pond by the chapel. Lots of big Bullfrogs. I don’t remember seeing teal back then, but I’m not surprised… I don’t think I would have recognized the teal as special in those days. Interesting Chris, I lived not very far north from there, on King’s Row (just a little north of the TWU campus), at the time. Bonnie was in charge of the computerization program for the TWU library then, and I spent quite a bit of time on the TWU campus when I was in town from my job at University of Texas at Brownsville. Denton is a nice town. I also spent a lot of time along the Elm Fork and the upper end of Lake Lewisville. The confluence area of Clear Creek and the Elm Fork is a place that is worth visiting for wildlife if you get the chance to get out there. It is Corps of Engineers property, but is a natural learning area for Denton Schools now I believe. Either that or a nature park for the city.